BillerudKorsnäs and researchers at Uppsala University in Sweden have taken an important step towards the development of paper batteries. Together they have taken basic research based on pure cellulose from algae and developed it to work with the same type of fibre that BillerudKorsnäs usually uses to manufacture packaging material. 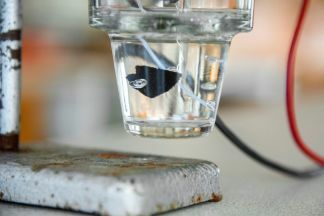 This development opens up for both inexpensive and eco-friendly batteries, they say. The long-term aim is to enable large-scale production and the future use of paper batteries for applications in areas such as smart packaging. “What’s special in this case is the model for collaboration between the partners that has resulted in technology adapted to large-scale production processes. We’re combining the deep theoretical expertise of the researchers with our understanding of innovation and production technology. By successfully creating a joint platform, we can focus our work on creating an advanced product that can still be produced in an effective way,” says Lars Sandberg, project manager for innovation at BillerudKorsnäs. In the long term, the paper battery opens up possibilities for developing packaging that is both smart and more sustainable. Small paper batteries with sensors can, in the future, open up for packaging that can be traced through the entire transport chain. This includes, for example, packaging that measures temperature or position in real time and provides information on what is happening with an item during transport. A paper battery entails many new ways of using packaging and can thus offer exciting opportunities for the packaging industry. For example, a light sensor along with a paper battery could provide information on where in the transport chain a product disappeared from its packaging. “The paper battery is a key piece of the puzzle in efforts to produce smart packaging that requires small, sustainable power sources. By enabling this type of sustainable packaging, the work on the paper battery is fully in line with BillerudKorsnäs’ vision of challenging conventional packaging for a sustainable future. Storing energy in paper instead of in lithium batteries, for example, allows for bio-based batteries that can form part of a circular system, which provides major sustainability benefits.” says Magnus Wikström, technical director at BillerudKorsnäs.